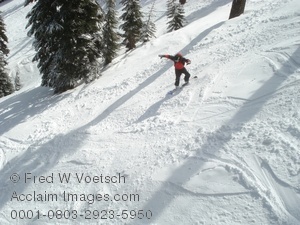 Description: Stock photography showing a snowboarder snowboarding down the slopes at Mt Ashland in March of 2008. This stock photo shows a person snowboarding underneath the Comer Ski Lift on a beautiful sunny winter day on Mount Ashland. The snowboarder is a bit blurred from his movement down the slope.